1、Luban stool is made of one wood plate through sawing, planing, milling, drilling, chiseling etc. without nails and any metal components. no traditional "Mortise and tenon structure". It can be opened and closed freely, but can't be separated. 2、Because of complex structure and process，no automatic machine can be used. All made by hand. A veteran carpenter can finish one stool about two days. 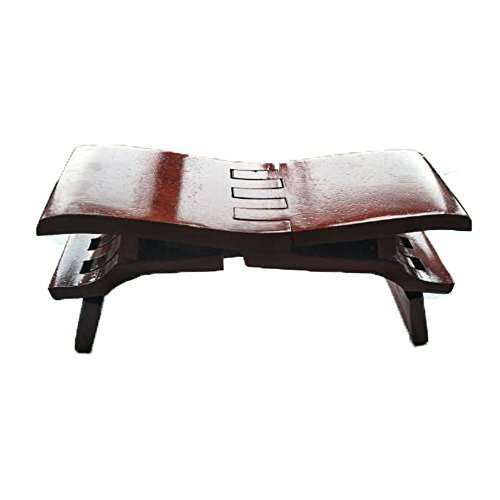 3、Luban stool is the crystallization of the wisdom of Chinese nation. It has a quite high technical content and art value. It's not just a tool ,but an artwork. It is facing loss as fewer and fewer people who are proficient in this craft. 2. Use it in Garden for cup of tea or as a bedside table or Fishing Hunting Stool. If you have any questions about this product by HAIBEIR, contact us by completing and submitting the form below. If you are looking for a specif part number, please include it with your message. PJ Portable Seat - Stand-up Leaning Seat Compact Mini Folding Lightweight Adjustable Folding Stool for Concerts, Amusement Parks, Travel, Hiking, Camping, and Office.